Robots are so prevalent in the media and in the real world that it seems they’ve always existed, though of course that’s not the case. 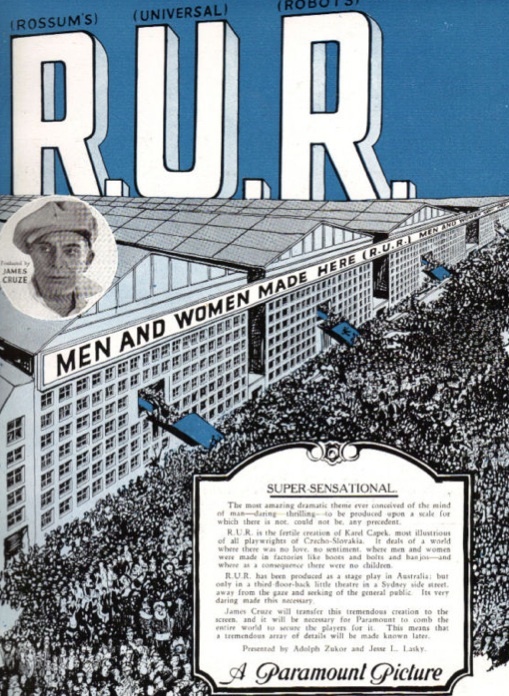 Even before Isaac Asimov and his laws of robotics, there was Karel Capek’s R.U.R. 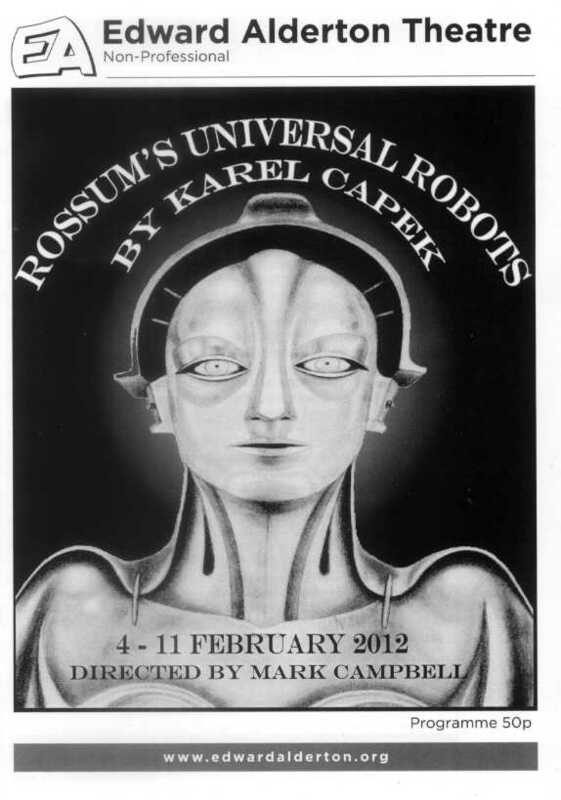 (Rossum’s Universal Robots). Capek, a writer from Czechoslovakia, wrote the play in 1920. The term “robot” came from the Czech word “robota,” which means drudgery or forced labor. The term actually dates back to Czechoslovakia’s feudal past — “robota” meant the two or three days per week that the peasants had to leave their own fields and work, for free, on the fields of the nobles. Even though this play is approaching its 100th birthday, the ideas in it — namely, that our robotic servants could rise up and overthrow us — remain more relevant now than ever. The language in the play is a little dated — it’s got that stilted and formal tone of older language that takes some getting used to, but it doesn’t take long, largely because Capek starts right off with the robots. We get the backstory regarding their creation (two characters who don’t appear onscreen — Old and Young Rossum, who were the brains behind the enterprise), but the majority of the play focuses on how it all plays out. The technology isn’t totally clear — the Rossums were inspired by nature, as so much tech these days is, so they’ve got brains, organs, nerves, etc. But those body parts are made in a unique way — organs are prepared in massive vats, nerves and veins are woven at a spinning mill, and the skin of the robots is mixed with a pestle. It’s interesting that the first robots in sci-fi weren’t made of machinery — they were a lot more like Cylons. Another dated, but ultimately forgivable aspect of the play is its sexism. There’s only one female human character, Helena, whose mere appearance at the Rossum factories inspires every male character to fall in love with her. The general manager, Domin, even proposes to her at the end of Act I, and even though she’s known him for about five minutes, she accepts. It’s silly, sure, but it’s a crafty way to keep Helena around, which is important. She visits the factory in order to advocate robot rights: “Good heavens, you are living creatures, just like us, like the whole of Europe, like the whole world. It’s disgraceful that you must live like this,” she tells a robot secretary. It’s ultimately Helena’s view that triggers a series of events that cements the downfall of the human race. Rossum intended the robots to free man from the “degradation of labor,” and that’s just what they do. In fact, they’re so effective at laboring that they replace human laborers, which at first seems like the whole point, but later becomes problematic. The rise of the robots has a number of effects, one of which is the lack of human births. Whether it’s the punishment of God, as suggested by a particularly religious character, or simply the fact that the world no longer needs humans, homo sapiens cease being able to reproduce. Meanwhile, Helena convinces one of the roboticists to give the robots “souls.” In her mind, this is because a soul is really the only remaining distinguishing factor between humans and robots. The plan backfires when it becomes clear that a soul doesn’t just enable love and compassion, but also enables negative emotions such as resentment and hatred. The robots release their endured position, but instead of accepting it like Asimov’s robots do, they just get pissed at being enslaved by what they see as an inferior species. Three guesses about what happens next, and the first two don’t count. By far the most intriguing part of the book is the epilogue, which supports multiple interpretations. My students and I talk at length about whether the ending is pessimistic or optimistic — it could be either, or both at once. Robots do end up inheriting the Earth, which could be seen as sad if you’re invested in the continued existence of the human race. Or, for those who believe in natural selection (or unnatural selection, as the case may be), the ending suggests that a species more fit than humans — and perhaps with fewer of humanity’s flaws — will proliferate on Earth. That the first work about robots also described humanity’s fall at the hands of their robotic slaves shows just how old this concept is, and demonstrates that people have predicted this potential outcome for a long time. Frankenstein was the first work that illustrated the dangers of man creating artificial life; R.U.R. is the first to illustrate the dangers of man creating robots. Most robot stories since have played on this same theme, and institutions such as CSER currently study the likelihood of such an outcome. R.U.R. is still performed at theaters, and has inspired various updates and remakes, including the 1948 TV movie, the 2013 TV short (below), and a forthcoming 2016 movie. With each iteration of the story, it becomes more and more clear just how prescient Capek was. But here’s hoping he didn’t get everything right.